I, Ville Varis, now live at our Erävaris Crow’s Nest, at my parents’ former farm, in Viitasaari in Central Finland. Here, at a farm called Leppänen, I live with my wife Sanna and our children. Our nest lies near the rapids trail Kolima-Keitele, by Leppäsenkoski rapids, the best trout fishing areas in Central Finland. Also Kärnänkoski and Kymönkoski rapids are nearby, and the lakes, too, are rich in fish. 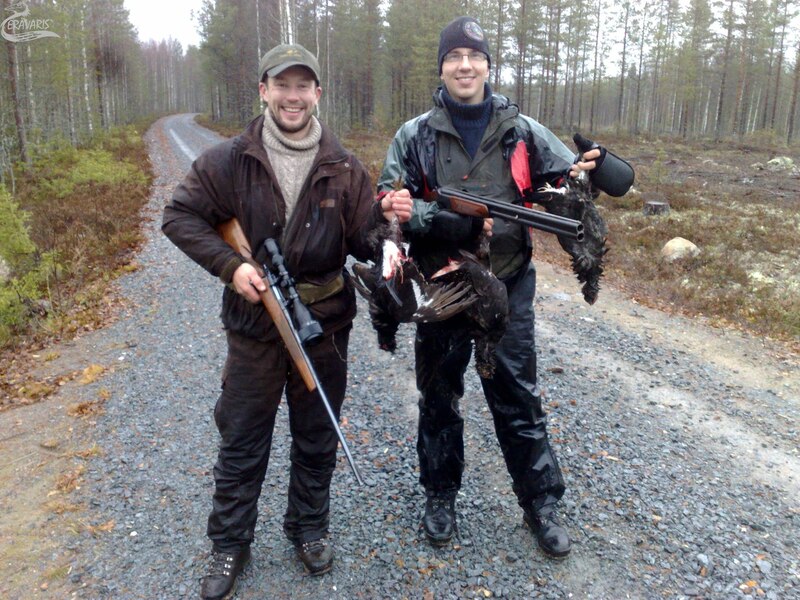 We are surrounded by forest landscapes rich in game, so we are blessed with versatile hunting choices. We’ll plan the excursions according to your wishes – and just going into a forest together is a memorable experience. We have a guide to take us along the Kolima-Keitele rapids trail He will show us the best fishing spots and give us advice for catching wild trout or grayling. We’ll plan these excursions according to your wishes. 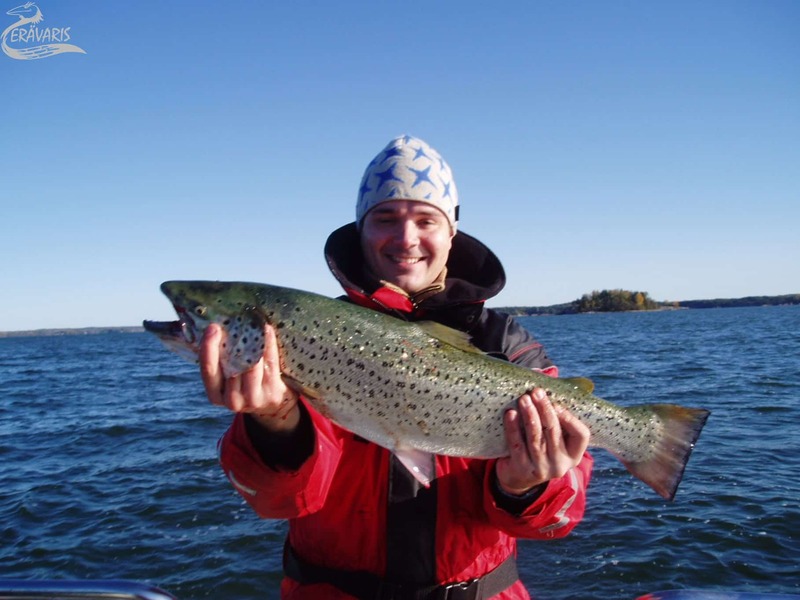 We’ll sail our raft to a spot where fish is abundant on Lake Ilmojärvi and cast the anchor. We’ll put the worm on the hook and lure schools of fish there. In between, we’ll enjoy delicious sausages, juice and campfire coffee. We also offer cosy and high quality cabin accommodation by the rapids trail: 8+2 beds and all the amenities including a sauna on the shore. On the cabin terrace you can hear and see the rushing waters of Leppäsenkoski rapids nearby. As a young crow (Varis=Crow) I tested my wings in many chores on my father’s farm. Sometimes I fell on my tail, but every time I got up and tried again. This taught me to do many things, to wander in forests and along waterways – and to get on with other creatures. Already when I was a young crow I found the power of life in the forest and learnt how to fly – higher and higher, in my imagination. Our cliffs, sculpted by Nature, offer challenges for abseilers – also in winter when you can ice climb at natural ice falls. Both the steepness and height of the cliffs offer many alternatives. We hike to the cliff area along small paths until we get to the top of a steep hill. In this rugged and steep landscape you forget about your everyday worries – at the latest when we descend 30 metres down the precipice. This excursion takes 1-2 hours. 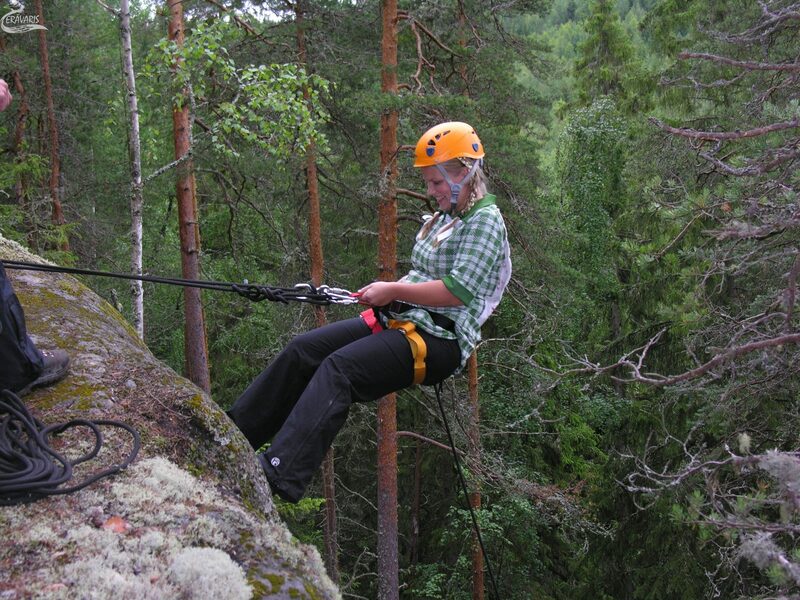 The descending height from the top of Savivuori Observation Tower is about 24 metres, and the abseiling is an unforgettable experience. We can get there by car, and the whole thing – including the preparations – only takes five minutes. Like other young crows, I’m curious and social. Therefore wilderness activities like hiking, fishing and hunting are the best jobs for me – and it’s been that way for 20 years already. I like practical jokes, too, and I try to learn new things all the time. I want to offer you all the good things I have been given myself: canoeing, wandering, hiking, fishing, hunting, climbing and last but not least, making traditional rye bread. We also offer accommodation in a log cabin near a rapids. We’ll take along our Nordic Spitz and begin searching for gamefowl in the Kymönkoski forests. The excited barking makes the hunter’s heartbeat race, and capercallies (wood grouses) and black grouses will constitute our catch. The hunting party prepares for the elk hunt in a traditional manner, and a group of skilled hunters has the best chances to succeed – maybe even felling a male elk with magnificent antlers. We have been hunting raccoons with a bay dog – and you can feel the excitement in the pit of your stomach. We organise Small Beasts of Prey Hunting Excursions in two ways, either stalking or actively, using a dog. In the snowy forests in Viitasaari, a white hare is like a ghost, so it is a very challenging catch – and precisely for that reason worth a hunting excursion. We’ll have a hound with us. When I was still a young crow, one of my most memorable experiences was finding an Umpipuu tree in the forest. An Umpipuu grows into itself so that a branch forms a wooden loop. For me, it stands for a special circle of force with magic in it. When I go hunting in the moonlight and need special force to catch a fox, I jump through the loop of Umpipuu and then start to stalk my prey. This force really takes me forward! Out here in a rural milieu, We are never short of activities to share. We create programs for your party according to your wishes in the forest and on waterways, and we can also provide charming accommodation. 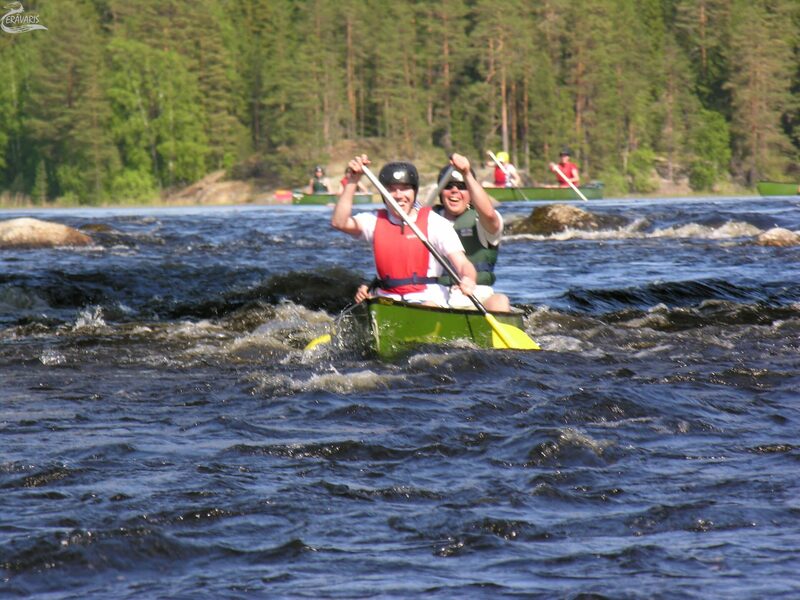 We’ll canoe along Kolima-Keitele route, starting from Leppänen farm, the nest of Erävaris. We use Canadian canoes to glide along the lakes, streams and rapids for a little over an hour. The excursion ends at Lake Keitele. Together we’ll make rye bread in our wood heated baking oven. Our sourdough, over 150 years old, has been preserved from one generation to the next. In addition to baking, we’ll enjoy the great outdoors and have coffee in a rural milieu. This program takes half a day. During this event, canoes tip over and everybody gets wet: two teams not afraid of water use canoes to see which team scores more goals. A sure hit on a warm summer day! We’ll lead your group into the forest, study its flora and fauna, climate and types of forest. In between exploration and discussions we’ll grill sausages over the campfire and enjoy our other provisions. In this competition we use our wits, skills and luck either in the garden or in the forest: the group is divided into two, and the battle for boiling point is about to begin. Whose mass kit vessel will be the first to have the water boiling? I would like to show you the best of my beautiful home region and the versatility of the natural surroundings in Central Finland. I want to take you into the forest, to hike along small paths, marvel at the huge cliffs, drink from a clear spring, sit around a campfire and troll in the rapids. We can go canoeing, rowing, climbing, hiking, hunting and fishing. And when we are quiet in nature, we may hear what the forest is whispering to us.